Do ladycats wear baseball caps? This one does! The Chase for the Sprint Cup begins today and we are card-carrying members of #HarvickNation!!! Today we're joining the Sunday Selfies Blog Hop hosted by The Cat on My Head. So Truffles - would you ride in the car with Mr. Harvick? That's a real cool selfie there Truffles, love you in your special hat! Very neat that you found a kitty-sized hat for your selfie. Well, it's nice that we agree on Hendrick Power winning the day, but your hat is missing an 8. Move over Happy, the 48 is coming through on the way to Victory Lane. That's a great selfie Truffles. Truffles, that is one terrific hat and a great selfie. We love your fur colors Truffles. You all have a great Sunday. You look really cool in your hat, Truffles! You wear it well! Great look! That is a great selfie of you in your cap Truffles. You hat looks great. Good luck! Love the Selfie Truffles! Hope you enjoy your cars buzzing around the track today! Love the hat! Yous makes it look so furry chic!!! Nice selfie! We are Bush fans--we live in Vegas! Love the hat, wherever did you find it? 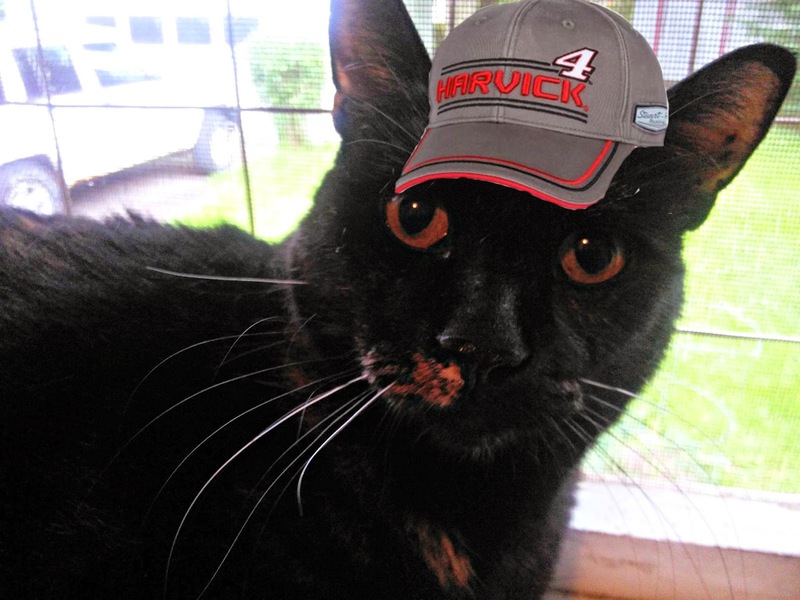 We can see you are a true Kevin Harvick fan, Truffles! That cap looks so cute on you. Of course cats can wear baseball caps. You can wear anything you can manage to get into actually.